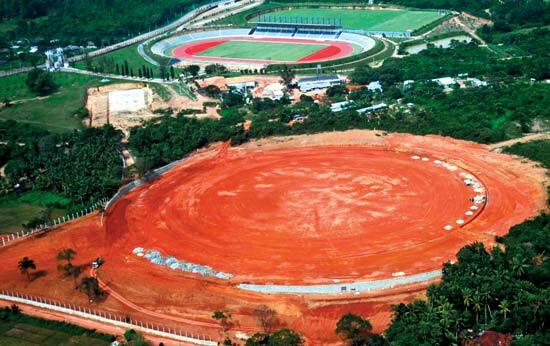 President Mahinda Rajapaksa inspected the on-going work of the Mahinda Rajapaksa International Sports Complex and the International Cricket stadium in Diyagama, Homagama yesterday. Here, Athletic Association of Sri Lanka President Major Genaral Palitha Fernando and Project Manager Lt Col N.P.K. Jayawardena showing the president the plan for the Cricket Stadium. Airport and Aviation Limited emerged overall champions while the Srilankan Airlines emerged runner up at the 27th Mercantile Athletic Championship which concluded at the Sugathadasa Stadium yesterday. Ashan Silva, the leader in the AMRC McLarens Formula 1300cc extended his lead yesterday by adding 18 points to his tally to have a total of 38 points from two stages. Ashan had a field day yesterday in Pannala in addition to his Formula races winning the second race of the 1600cc class support race run on the same track. Kandy Sports Club’s rugby coach Johan Taylor won the overall nett title at the second annual Oman Air Open Stableford Golf Championship 2010 organized by Victoria Golf and Country Resort and sponsored by Oman Air and concluded at the Victoria Golf Course at Rajawella yesterday.